Frankie Switchblade is clad in black, with skull & crossbones printed on his kick pads. 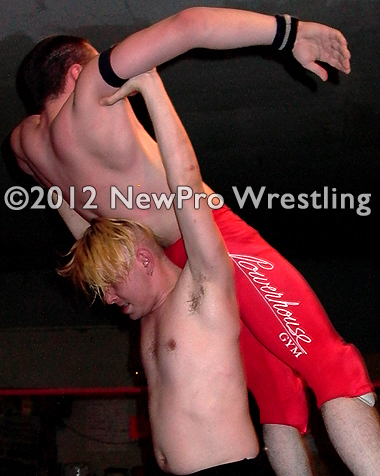 His opponent Talon Werely is in red tights & amateur wrestling shoes. If you think you've seen it all before, than think again. Frankie Switchblade and Talon Werely push each other to the edge, all the way and back again, and than right over that edge in this 20 minute Iron Man matchup. The action is fast & furious, sudden & unpredictable and will have you on the edge of your seat. You won't have to wait long for the first fall: Talon flips over to reverse a headscissors and pins Frankie's shoulders down for a 3-count. Things don't get much better for the unorthodox blond grapple-master, as he loses the next 2 falls in a row, putting him down 3-0 in the first several minutes of the match! Just when it looks like he's about to go down 4-0, Frankie hits a TKO out of nowhere to swing momentum in his favor. Frankie hits a rocker dropper for a 3-count followed up by a Rings-of-Saturn submission to even the score up 3-all. You won't believe your eyes as the match progresses, and eventually one ring general gains the winning fall with 5, YES 5 seconds remaining! 15 falls total, for 15 exciting finishing submissions/moves! 20 minutes of mayhem from these talented Georgia pros!